Hunting Party, oil on canvas, 30" x 48", s.l.l. The small country of Scotland exerted a disproportionately large influence on American art of the nineteenth century in the form of emigre artists, among them William Keith, James Hope, John Williamson, Walter Shirlaw, James Smillie, James Fairman, and the brothers William and James McDougal Hart. But arguably the finest artist among these Scottish emigres was Andrew Melrose. Born in Selkirk, Scotland in 1836, Melrose is assumed to have been self-taught in that no record seems to exist of his training. He came to the United States sometime in the mid 1850’s. After the Civil War, Melrose called New Jersey his home, maintaining studios in Hoboken and Guttenberg. He exhibited regularly at the National Academy from 1868 to 1883. The term “home,” however, must be used with circumspection in Melrose’s case; his fascination with the customs and the topography of his adopted home led him to travel incessantly. From the Adirondacks and the White Mountains to the deep south, from the mid-west to California, Melrose, a prolific painter, documented the country. One of his favorite themes was the New York Battery and the harbor of New York, from which he made a series of chromolithographs. 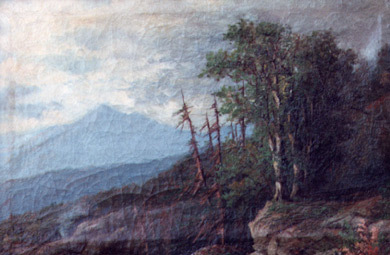 The Hudson River Valley, 12 1/2"x18 3/4", o/c, s.l.l. And if his subject matter was diverse, so was his style highly versatile. 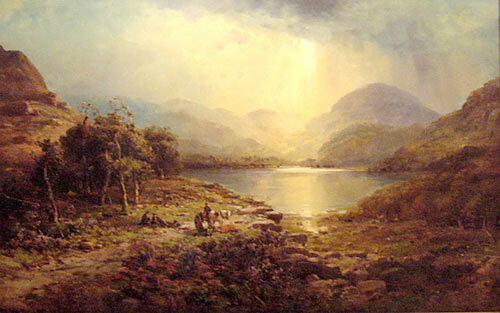 A consummate painter in the Hudson River style during most of his career, he was clearly an admirer of Frederic Church and adopted some of Church’s motifs in his own paintings. His later work, however, shows his brushwork loosening considerably, perhaps under the influence of the Impressionists. Compositionally, too, Melrose felt equally at home with panoramic vistas or with more close up, intimate views. Andrew Melrose is a painter whose conspicuous talent and the breadth of whose artistic output demand far more attention from art historians than he has thus far received. He died in West New York, New Jersey in 1901. Works by Melrose can be found in the Georgia Museum of Art, the Joslyn Art Museum, the Newark Museum, the New York Historical Society, the Adirondack Museum, the St. Louis Art Museum, and the White House.